Dr Stephen Strange a former neurosurgeon embarks on a journey of healing only to be drawn into the world of the mystic arts. This year has been another strong year for Marvel, with Captain America: Civil War being arguably the movie of the summer and the year kicking off with the runaway success – Deadpool, ok that’s not a Marvel Studios property but it’s based on a known Marvel IP. So here we are with 2016 starting to slowly wind down and Marvel release perhaps their most daring entry since The Guardians of the Galaxy (2014). 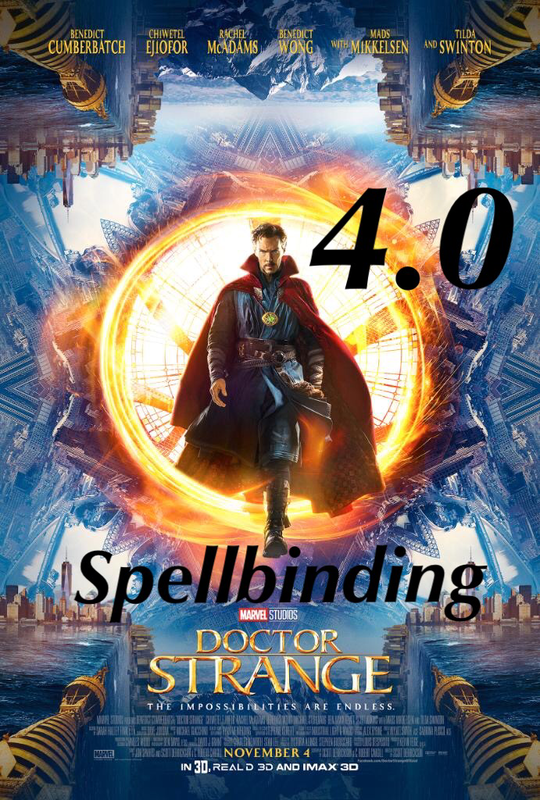 In Doctor Strange, Benedict Cumberbatch who is best known for his portrayal of Sherlock Holmes in the wildly successful BBC drama Sherlock, assumes the mantle of Marvel’s newest cinematic super hero. ​Doctor Strange knocks another ball out of the park for Marvel. It’s a spellbinding psychedelic rollercoaster of a movie that does not disappoint. By far the biggest star of the movie are the visuals themselves. Taking cinema to the next level very much like The Return of the King did back in 2003. Front and centre is Cumberbatch who plays brilliant but totally arrogant and self absorbed Doctor Steven Strange. The actor plays it as a mix between Sherlock and Tony Stark. Suitably detached as per the famous sleuth but never far away from a snarky quipped comment as per Iron Man’s alter ego. Being a fellow Brit and avid fan of Sherlock it took me a little while to adjust to the American accent, but it’s consistent and did not detract me from the movie. The movie is one of Marvel’s best origin stories as this brilliant doctor (Early demonstrated by discussing music choices with a fellow surgeon whilst carrying out complicated brain surgery) is humbled and broken after suffering a terrible car accident, with above all his career giving hands taking the brunt of his injuries. If there is ever an advocate for not using the phone whilst driving – this is the movie. His path to redemption and self discovery starts as he travels to Tibet to meet The Ancient One played by Tilda Swinton. 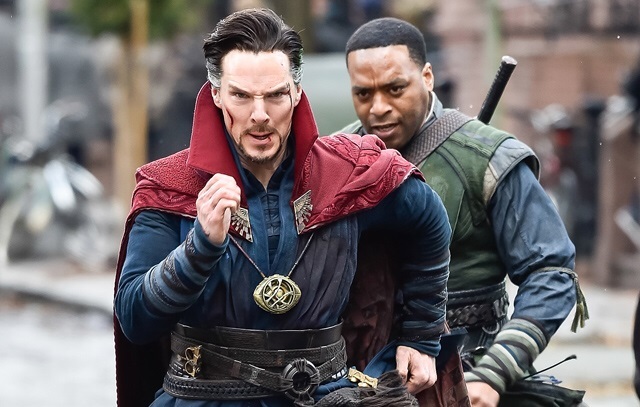 Doctor Strange has a strong cast with Ejiofor and Swinton being my favourite with the exception of Cumberbatch himself. 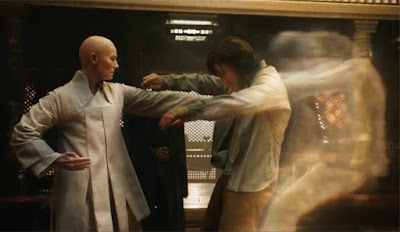 Ejiofor acts as a good foil to Strange and Swinton is perfect casting (Despite the whole white washing debacle in Hollywood) as the all powerful Ancient One. Benedict Wong is also excellent but slightly underused as Wong one of The Ancient One’s guardians. Mikkelson as well as we know is no stranger to playing a movies main villain (Casino Royale, 2006) so his portrayal of Kaecilus (Former pupil of The Ancient One) is excellent. Rachel McAdams as Christine Palmer, Strange’s colleague and love interest was good, but could have been played by any actress through. The visuals though as I say are the main star of the show, I saw the movie in IMAX 3D and highly recommend that you do too as a large portion of the film is filmed in that medium. It is a visually stunning movie that really pushes the envelope on what audiences have seen so far. What I liked about the movie though was not just the visuals but how the characters were seamlessly integrated into their surroundings. The movie looses no time in showing you what it’s got with mind bending fight between Tilda Swinton and Mads Mikkelson in an Inception style London setting within the first ten minutes of the movie. The pacing is good throughout and I became more invested in Strange’s story as the movie wore on. As this is a Marvel movie as well there is a healthy dose of humour which perhaps the funniest character being Doctor Strange’s cloak itself. Sound’s strange? Well that’s just the type of movie this is. My only real issue was the relationship and chemistry between Strange and Palmer (McAdams). It wasn't particularly natural, seemed tacked on for the sake of having a love interest for the main character and as I said earlier she could have been played by any other actress. The movie sits well within the whole MCU, I believed that this story exists in the same universe as Stark, Cap and the usual gang, they even get a reference at one point. As for post credit scenes, there are two one. One mid credit (Which is very funny) and one post credit (Which leads you into possible spoilers for a Doctor Strange sequel). 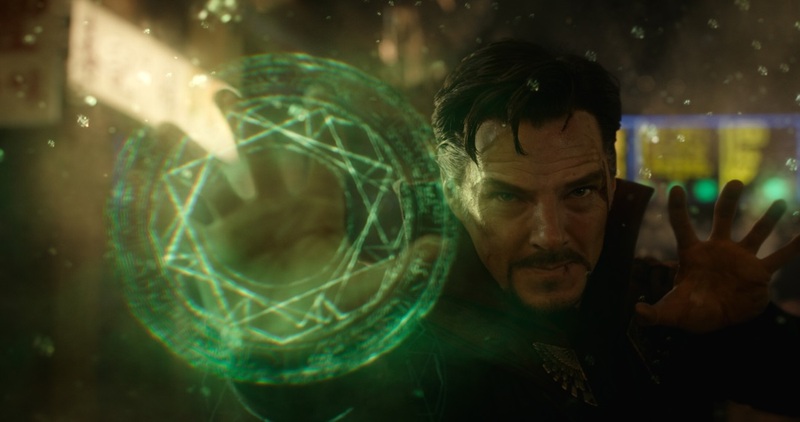 I highly recommend that you check out Doctor Strange, not only for the continuation of the MCU which is enough in itself but even more for the mind bending visuals pioneered by ILM. Treat yourself and enter The World of the Strange. Doctor Strange is on general release in the UK.